Sokha Hotels & Resorts - Corporate Office: Sokha is the biggest hotel operator in Cambodia providing an exceptional hospitality experience by delivering quality service in an atmosphere of comfort, openness and friendliness. 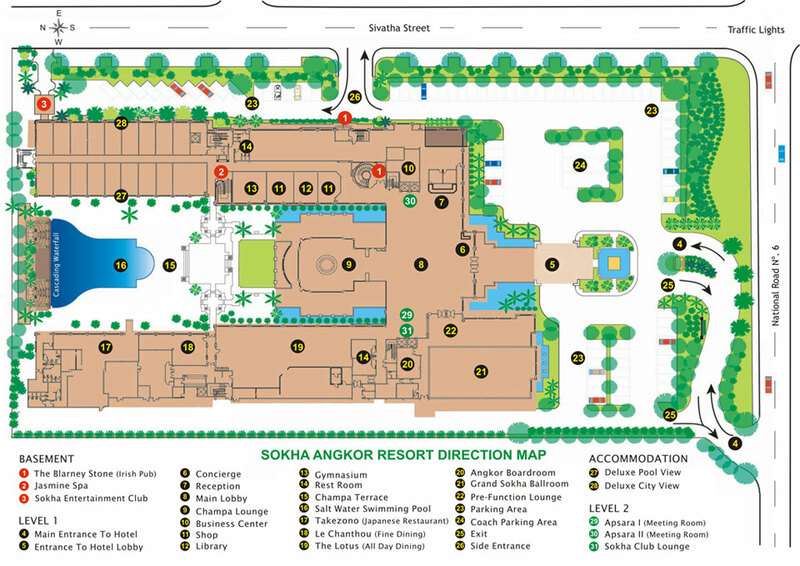 Sokha Beach Resort: The leading of the Traditional Khmer Hospitality. A beachfront resort with a “hotel within a hotel” concept to choose from. The Sokha Beach is a very popular destination both internationally and locally as it is well- maintained while its water is pristine along 1.5 km long stretched of white sandy beach. The beauty of Sokha Beach Resort is the architecture design of combination from the ideas of enthusiastically tradition of Khmer. Sokha Siem Reap Resort & Convention Center: Located at Angkor Cultural & Tourism Complex’s (locally known as Kyung-Kyu) most busiest local late afternoon attraction, the 23-hectares Sokha Siem Reap Resort is accessible in a few steps away from the newly established Angkor ticket booth terminal. Designed for natural living, the 776-rooms Sokha Siem Reap Resort is an authentique Cambodian resort designed to deliver a restful stay and a complete fresh-air breathtaking resort. Sokha Angkor Resort: The resort is a luxury five star resort, located in Siem Reap province, and offers very attractive remuneration and competitive employee benefits. The Resort is conveniently walking distance to the near famous Pub Street, popular local handicrafts and Old Market, 10 minutes drive from the majestic Angkor Wat temples. Sokha Phnom Penh Hotel & Residence: The hotel is strategically located on Chroy Changvar peninsula, opposite to the Royal Palace and approximately 13 km from Phnom Penh International Airport. Offering breathtaking view of the majestic Royal Palace, Chaktomuk River and a wide sweeping view of the untouched greenery rural beauty opposite of Phnom Penh capital, Sokha Phnom Penh provides the peaceful, less busy side of the congested capital. Thansur Sokha Hotel: Discover the first and only highland resort in the Mekong Sub-Region amid the pristine jungle wilderness and pleasant cool weather with beautifully landscaped hill on the Bokor Mountain, Kingdom of Cambodia. The resort is 45 minutes drive from Kampot town and 170 minutes away from Phnom Penh. Le Bokor Palace: Experience a luxurious and historical hotel since 1925, located between the tropical forest and the “Opal Coast” with pleasant cool weather and picturesque landscape on the Bokor Mountain, Kingdom of Cambodia. The Hotel is 45 minutes drive from Kampot town and 170 minutes away from Phnom Penh. Our mission is to provide a truly memorable Khmer hospitality experience that makes a lasting difference to people's lives by creating the feelings that their heart longs for. A dream-fulfilling true Khmer hospitality for a treasured one-of-a kind Southeast Asian Experience. The hearts of the guests are touched by the love and care of the employees and every interaction is a memorable experience. Our leaders are inspirational and create a motivating environment in which the core values, initiative and the sharing of ideas and experiences flourish. We are passionate about the vision, and exemplify the core values. We are extremely warm, loving, and caring, professional, very creative, focused on making the guests happy, and committed to the vision. They anticipate the guests' needs and are intuitive about the guests' feelings and dreams. Your contribution is important to the success of Sokha Hotels & Resorts. Our teams around the country endeavour to provide a safe, attractive and dynamic working environment, which will encourage you to take the initiative and demonstrate your best abilities. If your qualifications match our requirements, you will be contacted soonest. If not, please allow us to keep your information in our files for future opportunities.